Yes, we had to wait half an hour in the Sunday drizzle to sit down but that was nothing a moist, spongy pancake (slightly crispy around the edges) with a hearty slather of banana cream, chunky cherry compote and a scattering of toasted almonds couldn't fix. Coin Laundry, on the corner of Armadale Road and Feech Street, is always exploding with people - but not just the pram-pushers one associates with the tree-lined streets of Armadale. 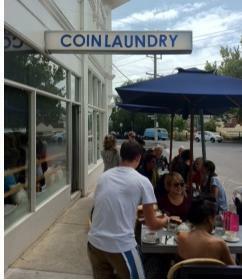 Last Sunday, Coin Laundry's clientele was a curious mix of lycra-clad after 'Tanners, hung over hipsters in vintage Ray Bans, and mums and daughters having a quick pot of tea. But it's the all-day breakfast menu that is the real drawcard here. Classic bacon and eggs is 'Coinlaundrified' with the addition of a dry, sweet beetroot relish that doesn't overpower the poached free-range eggs, as beetroot is often wont to do. Or opt for the smokey baked bean and fetta cassoulet, served with a peppy green olive tapenade and wild rocket. The coffee is easy-drinking and comes from Allpress - a fair-trade, New Zealand based boutique roastery, introduced to Australia by the legendary Tony Papas. Similarly satisfying is the bill: a creamy cappuccino and corn and manchego fritters with a big splodge of guacamole, tomato and corn and cucumber salsa won't even set you back twenty bucks. Recently renovated, Coin Laundry is all natural light, hand-sanded wood and warm cream paint. Rumour has it that business is at least double what owners Matt Vero and Steve Rowley were expecting when they opened their doors in September. So the only problem is trying to get in them. Why? Runny free-range eggs are well worth the wait. When: Open for breakfast and lunch, 7 days. It sounds as if the menu has a few 'typical' cafe dishes that have been refreshed and renovated (re: Coinlaundrified). Much room on the inside?